WhatsApp has updated its terms of service to allow businesses and users to talk to each other on its platform but says it doesn't want a "spammy" experience. WhatsApp: Brand communications tests began this year. WhatsApp has been testing business accounts since the beginning of the year, but this is the first time the service has baked brand marketing into its terms. There are no official tools available to brands yet, but the terms of service pave the way for marketers to start using the platform. It plans to allow businesses to talk to customers about orders, appointments, delivery, shipping, product and service updates and marketing offers. According to the company's blog, "Messages you may receive containing marketing could include an offer for something that might interest you." But it said the aim was to avoid a "spammy" experience, the company still does not allow banner ads on its platform. Brands could use the platform to send flight status notifications, receipts or delivery notifications, for example. Raluca Efford, head of digital and social engagement at Direct Line Group, said businesses' "desire to sell" must come second to consumer needs on a platform such as WhatsApp. ''A look at how Chinese brands have approached WeChat will provide a good starting point for any brands. "Clearly, there are lots of differences between China and the UK, however, no one can deny WeChat's phenomenal success, so it'd be smart to take some learnings from their experience." 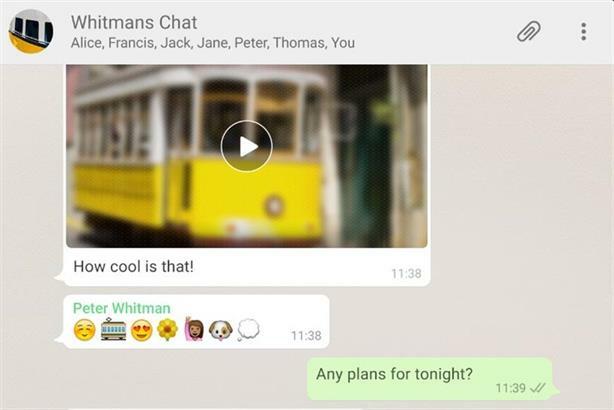 Users will be able to control communications for brands, though WhatsApp hasn't outlined how. As part of another key change, WhatsApp is now handing more data about users to its parent company Facebook. The social network will now use WhatsApp data, such as phone numbers, to inform what ads and offers to show users. The changes do not give Facebook access to the content of messages or account information. Nor does it allow Facebook to publish phone numbers. Users can choose not to see more targeted ads on Facebook through their WhatsApp settings.